Isabelle (Katie Goldfinch – Lucid, Shadows) is a young museum curator. They have an interesting piece at the museum, half of a metal cauldron, and her boss Professor Edwards (Phil Hemming – Autonomous) is very excited to learn that the other half may have been found. He immediately dispatches Isabelle off to Shropshire, to the home of the Scott Morton’s, to investigate the find. She is to stay with the family at their country pile where they have uncovered the cauldron in the basement while digging a gas main. Upon arrival they seem very personable and quite hospitable. She is welcomed by Karl (Larry Rew – Underworld: Rise of the Lycans), the master of the house and his wife Evelyn (Babette Barat – Lotus Eaters), who show her to her room and explain that the house used to be a boarding school for girls. They are currently in the process of renovating, but have yet to complete the wiring, leaving parts of the house ominously dark. The family also has a magnificently creepy and strange daughter, Scarlet (Florence Cady – The Burning) who fancies herself almost as much as she does Isabelle and thinks she is good at ballet dancing (she’s not, the whole thing is quite embarrassing). It soon becomes apparent that Karl is not a man to mess with, he is quick to anger and obsessed with getting money for the cauldron and Scarlet grows ever weirder as the days go by. Luckily she has found a friend in the form of Robert (Neil Morrissey – Men Behaving Badly, Waterloo Road), the gardener, and she may well need it as it seems this family are keeping some very dark secrets. Crucible of the Vampire is an enjoyable watch and is quite atmospheric in places. They are helped enormously by a great location, the house is a maze of rooms and corridors and ideal for this kind of story. The story itself is pretty good, if a little weird, but if you are into the Vampire genre then you have to suspend any previous expectations as this film messes with the mythology quite heavily. 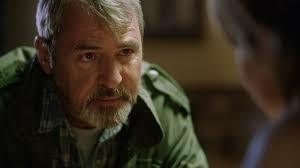 There are some good acting performances, Neil Morrissey is excellent, as is Katie Goldfinch and there is a nice twist at the end, satisfying albeit a little predictable. The special effects are very British, plenty of splatter and our heroine turns out to be rather feisty, which I liked. All in all, a good watch and worth adding to your collection.